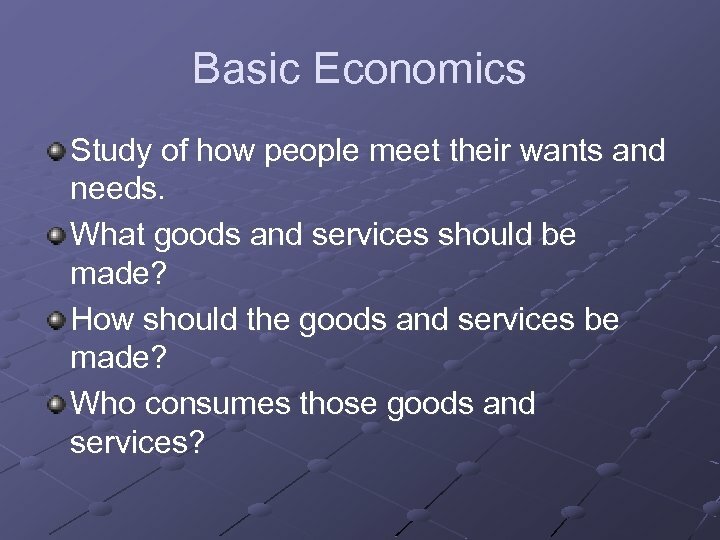 Basic Economics Study of how people meet their wants and needs. 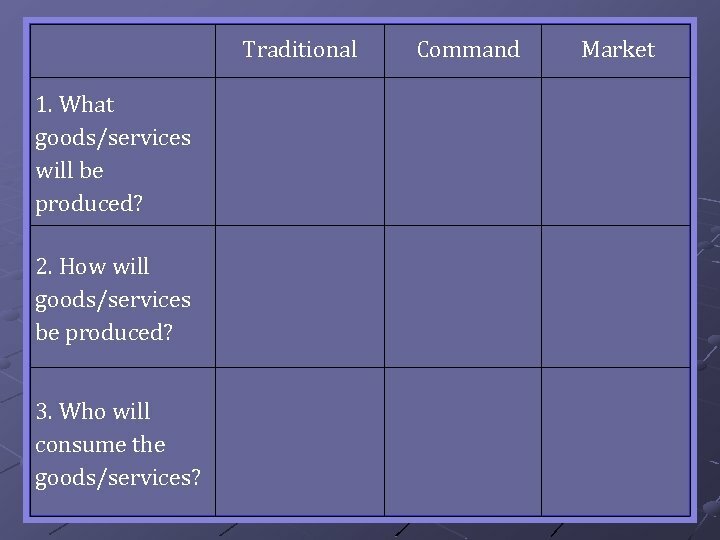 What goods and services should be made? 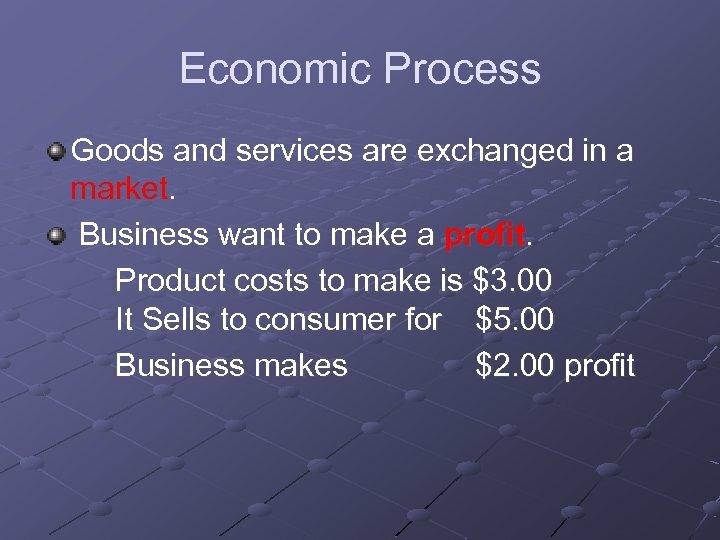 How should the goods and services be made? Who consumes those goods and services? 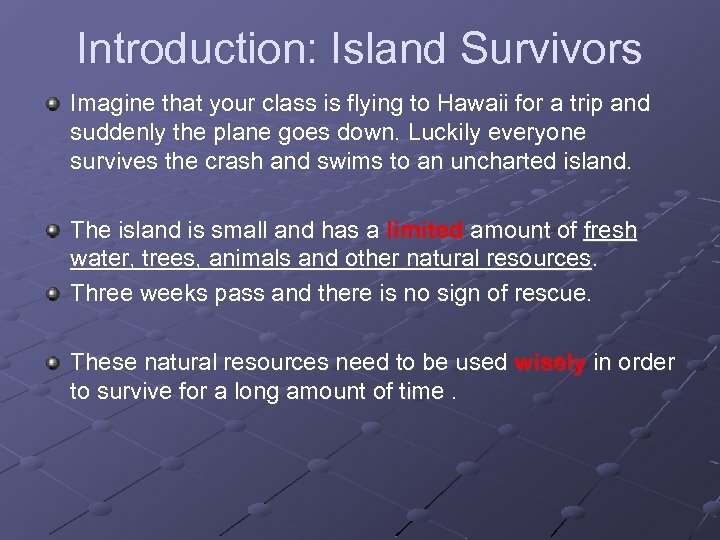 Introduction: Island Survivors Imagine that your class is flying to Hawaii for a trip and suddenly the plane goes down. Luckily everyone survives the crash and swims to an uncharted island. The island is small and has a limited amount of fresh water, trees, animals and other natural resources. Three weeks pass and there is no sign of rescue. 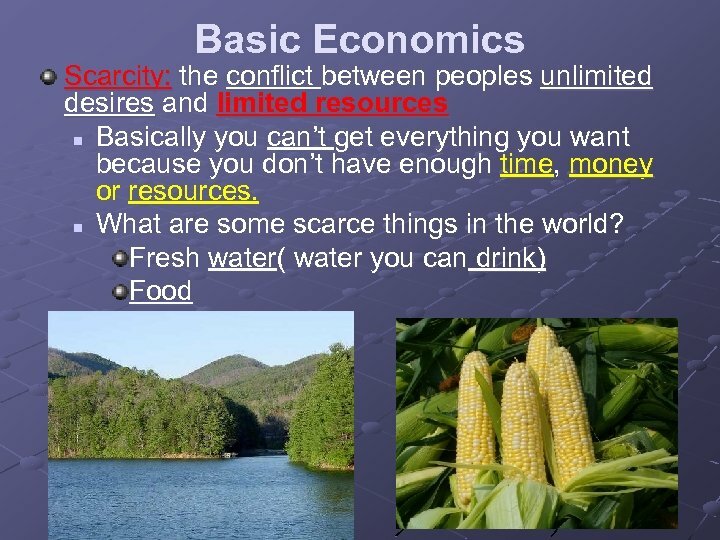 These natural resources need to be used wisely in order to survive for a long amount of time. 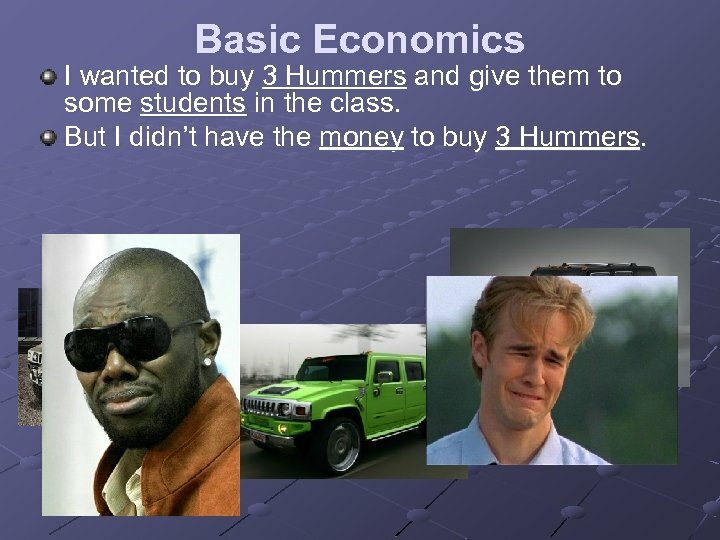 Basic Economics I wanted to buy 3 Hummers and give them to some students in the class. But I didn’t have the money to buy 3 Hummers. 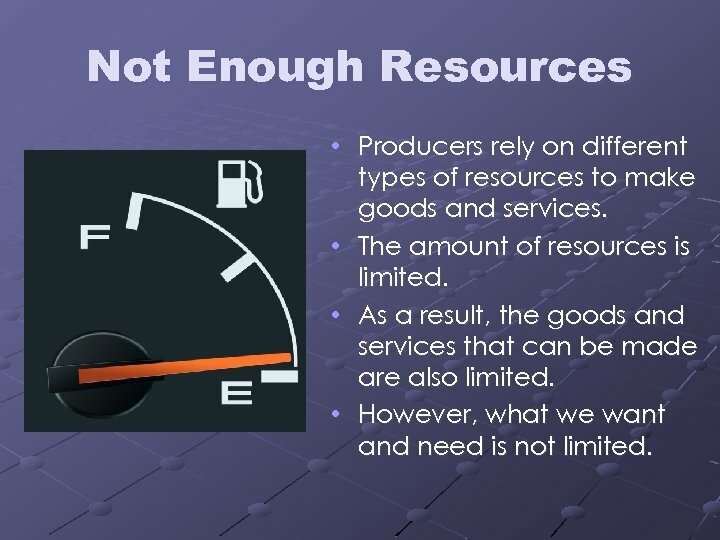 Not Enough Resources • Producers rely on different types of resources to make goods and services. • The amount of resources is limited. 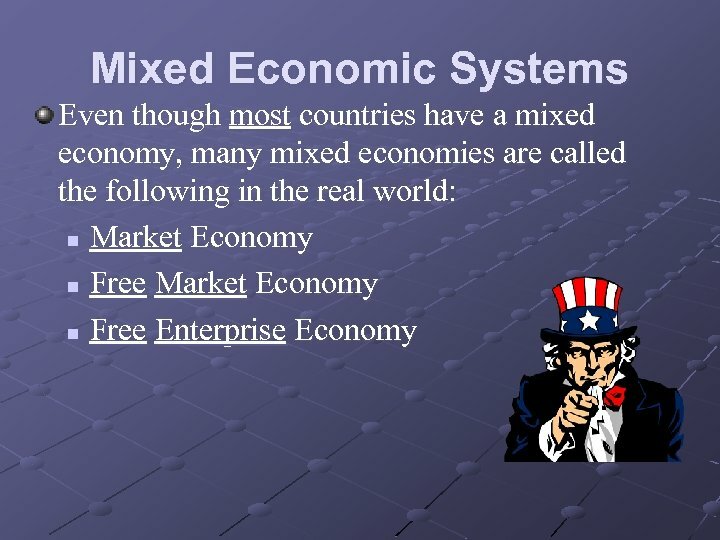 • As a result, the goods and services that can be made are also limited. • However, what we want and need is not limited. 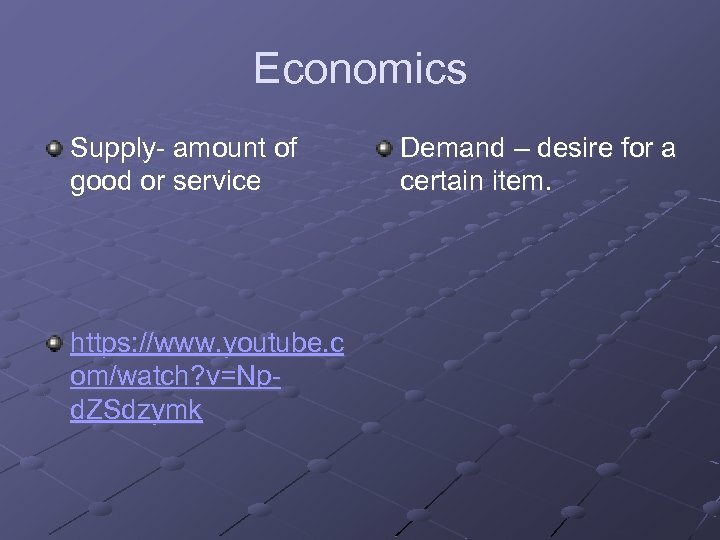 Economics Supply- amount of good or service https: //www. youtube. c om/watch? v=Npd. ZSdzymk Demand – desire for a certain item. 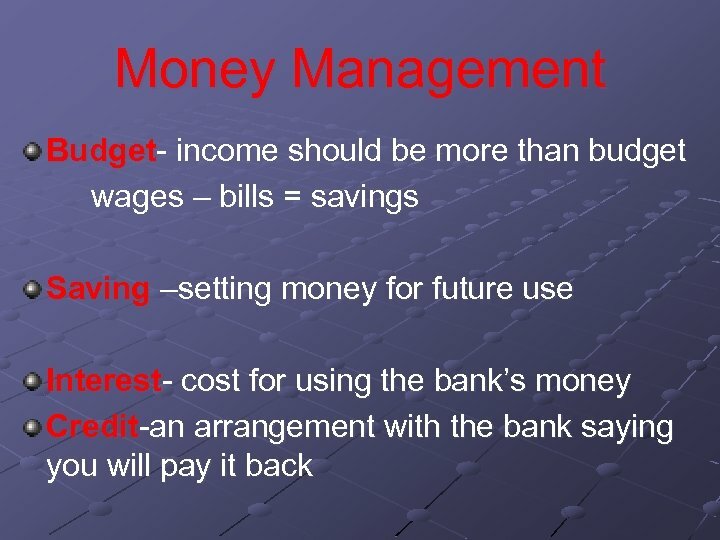 More Than Money Not all decisions involve money. What if your friend invited you to a birthday party but you already had a camping trip planned that day? 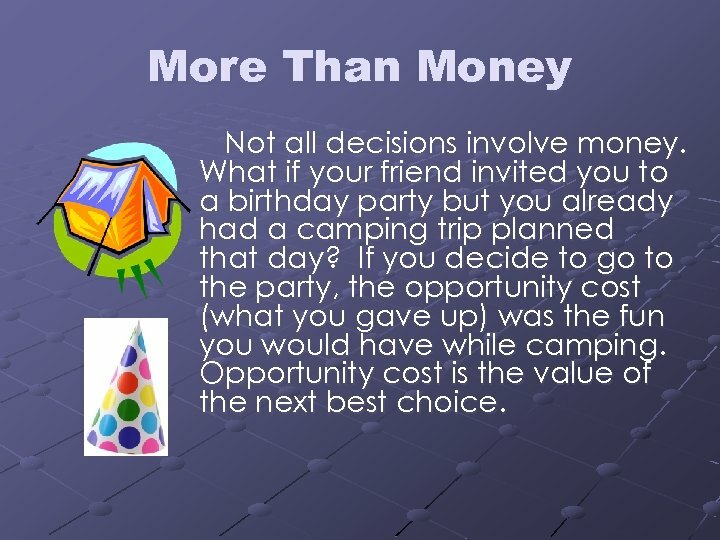 If you decide to go to the party, the opportunity cost (what you gave up) was the fun you would have while camping. 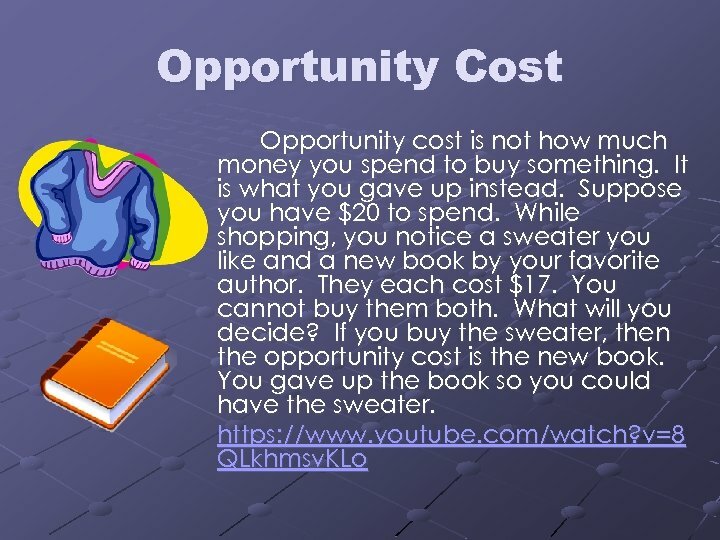 Opportunity cost is the value of the next best choice. 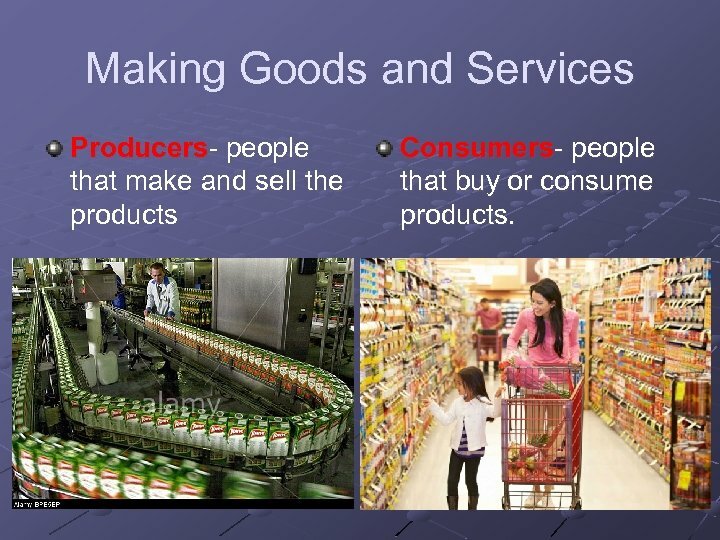 Making Goods and Services Producers- people that make and sell the products Consumers- people that buy or consume products. 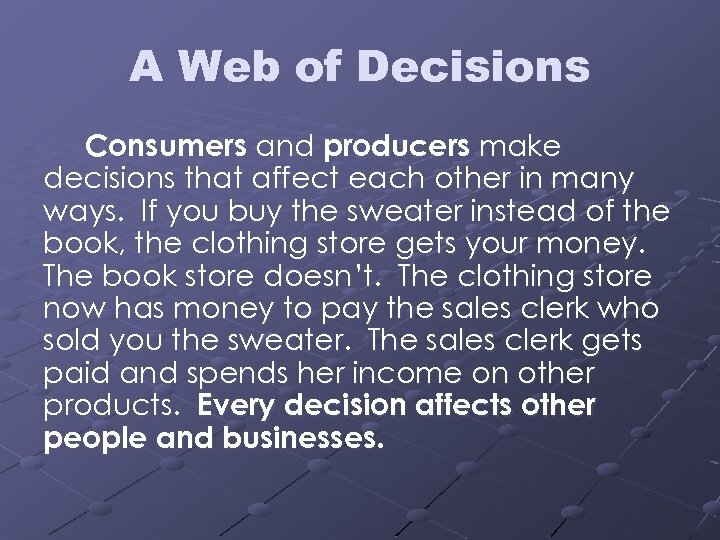 A Web of Decisions Consumers and producers make decisions that affect each other in many ways. If you buy the sweater instead of the book, the clothing store gets your money. The book store doesn’t. The clothing store now has money to pay the sales clerk who sold you the sweater. The sales clerk gets paid and spends her income on other products. 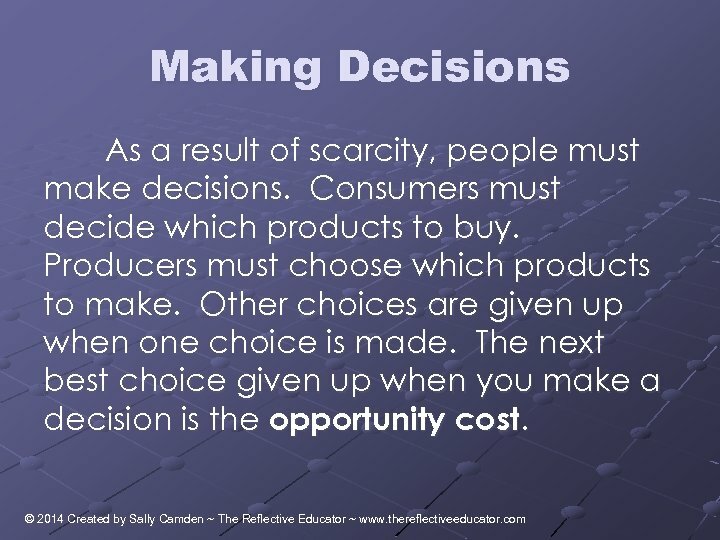 Every decision affects other people and businesses. 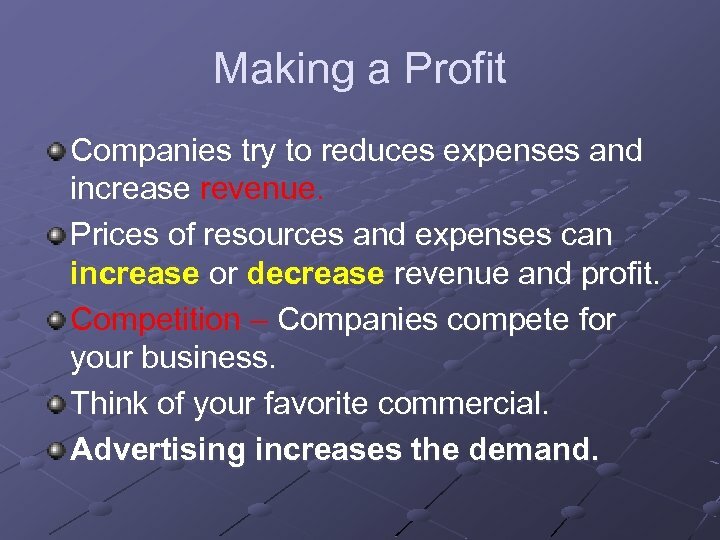 Making a Profit Companies try to reduces expenses and increase revenue. Prices of resources and expenses can increase or decrease revenue and profit. 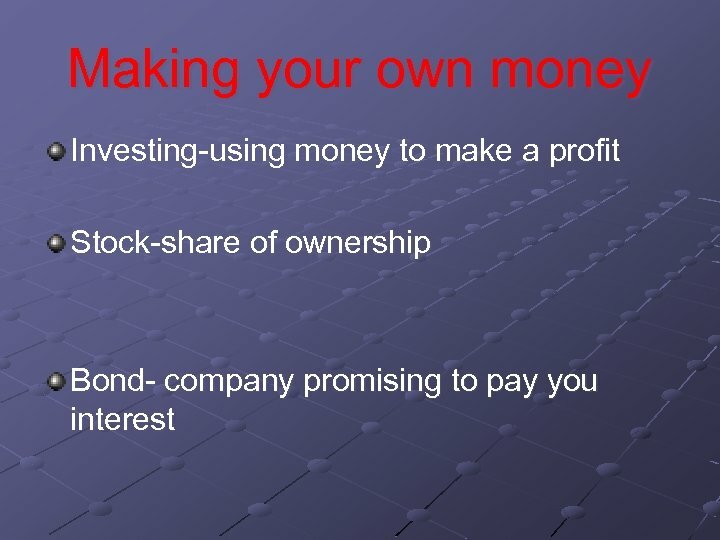 Competition – Companies compete for your business. Think of your favorite commercial. Advertising increases the demand. 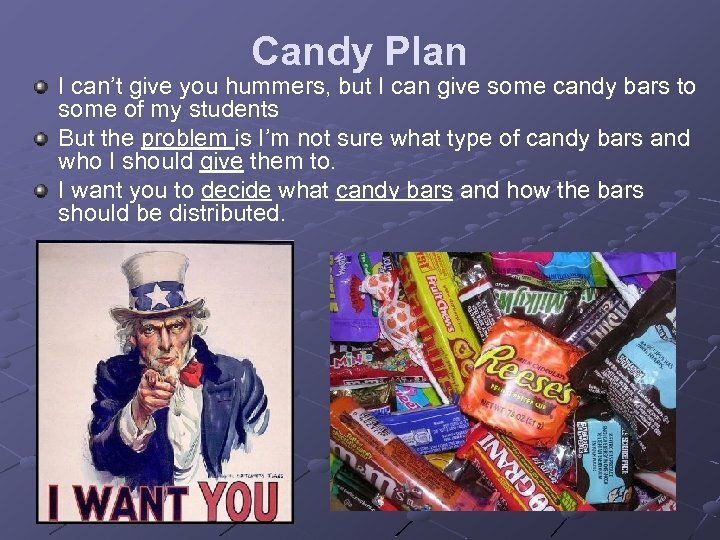 Candy Plan I can’t give you hummers, but I can give some candy bars to some of my students But the problem is I’m not sure what type of candy bars and who I should give them to. I want you to decide what candy bars and how the bars should be distributed. 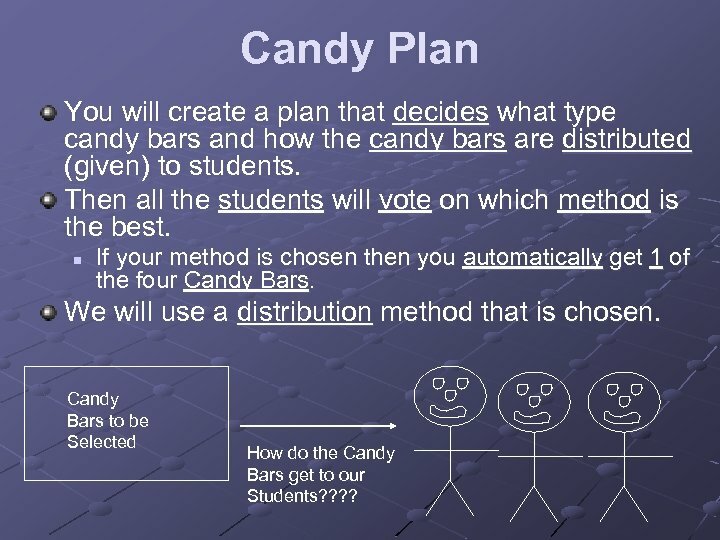 Candy Plan You will create a plan that decides what type candy bars and how the candy bars are distributed (given) to students. 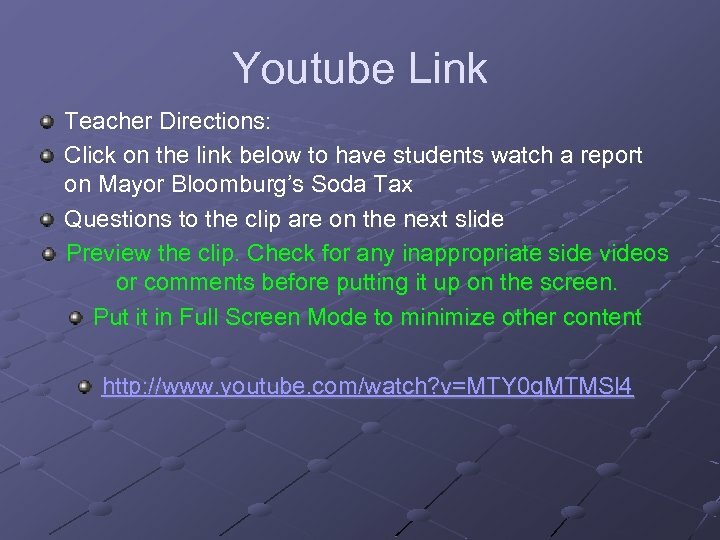 Then all the students will vote on which method is the best. 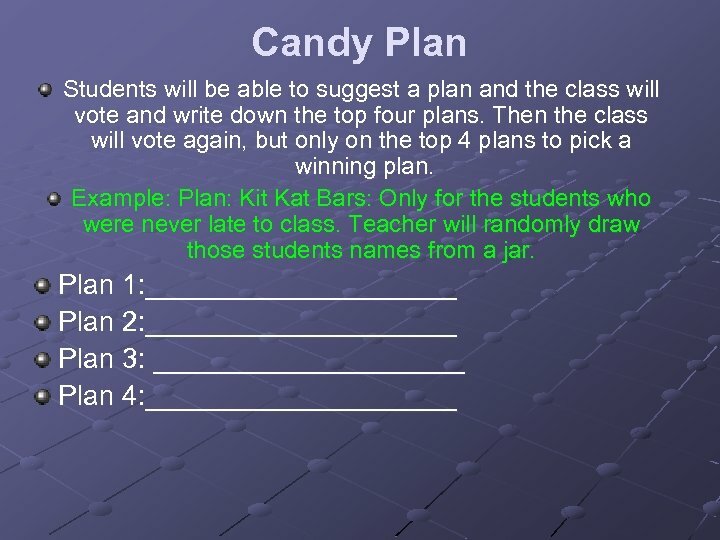 n If your method is chosen then you automatically get 1 of the four Candy Bars. We will use a distribution method that is chosen. 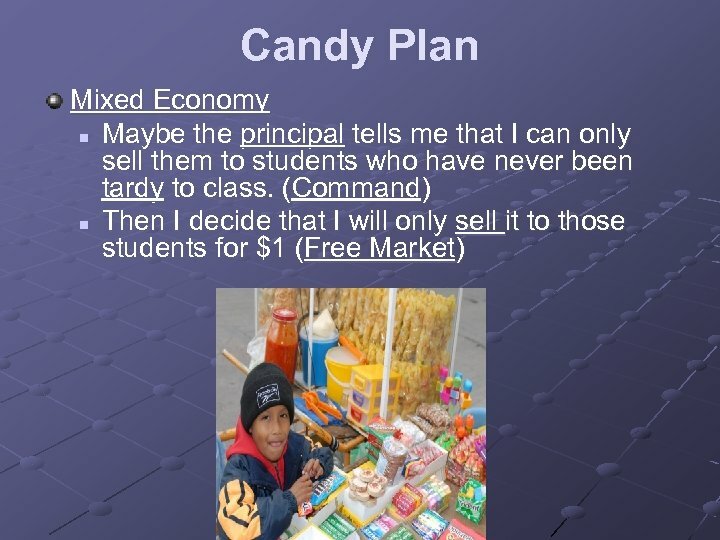 Candy Bars to be Selected How do the Candy Bars get to our Students? ? 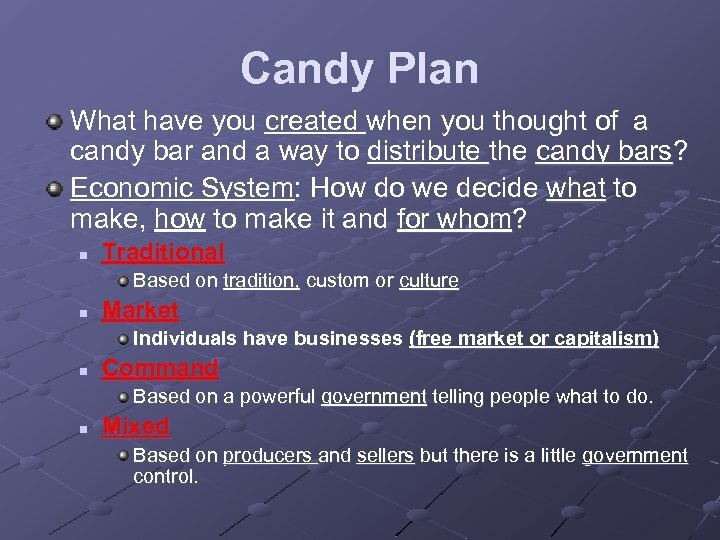 Candy Plan What have you created when you thought of a candy bar and a way to distribute the candy bars? 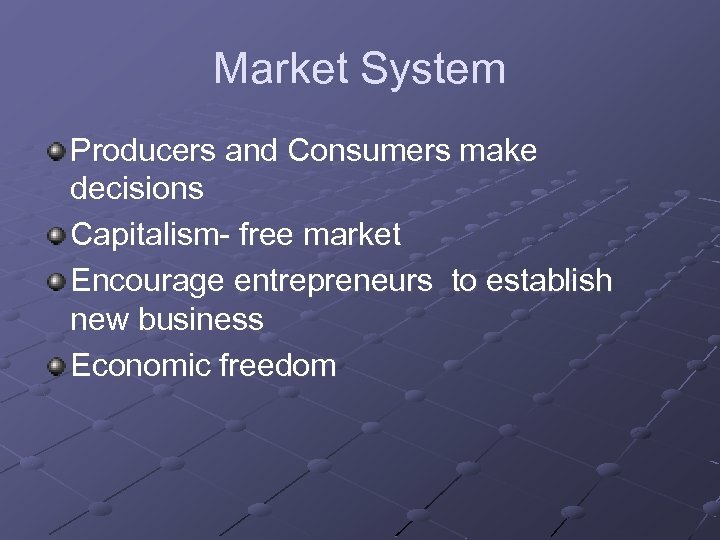 Economic System: How do we decide what to make, how to make it and for whom? 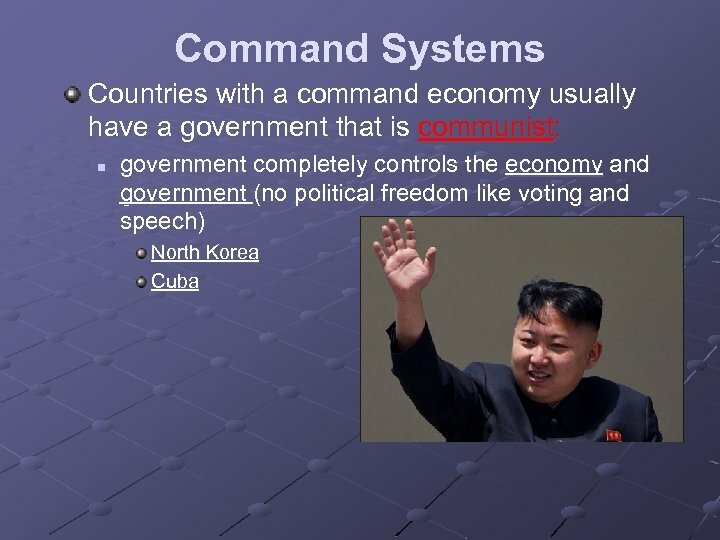 n Traditional Based on tradition, custom or culture n Market Individuals have businesses (free market or capitalism) n Command Based on a powerful government telling people what to do. 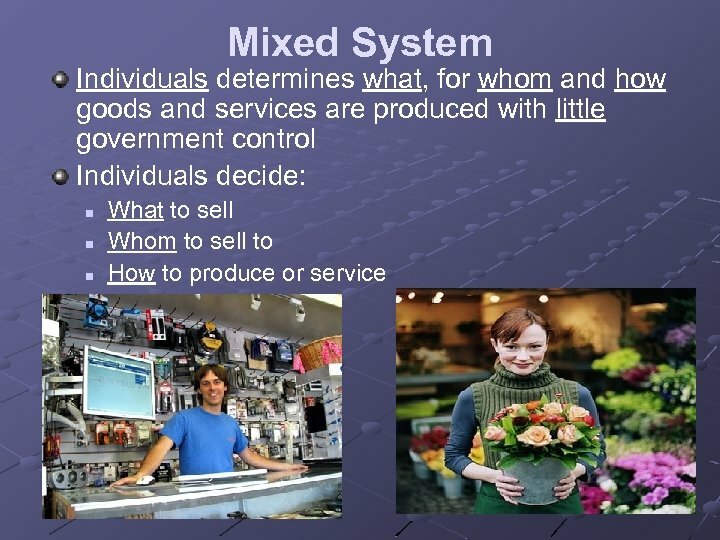 n Mixed Based on producers and sellers but there is a little government control. 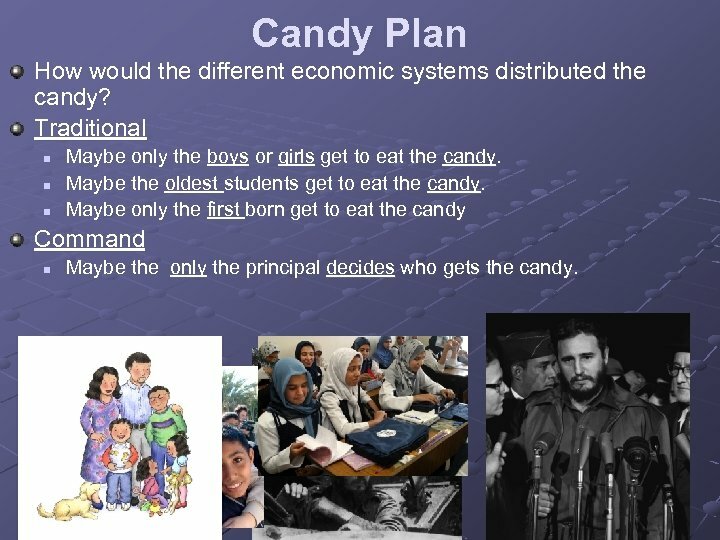 Candy Plan How would the different economic systems distributed the candy? Traditional n n n Maybe only the boys or girls get to eat the candy. Maybe the oldest students get to eat the candy. Maybe only the first born get to eat the candy Command n Maybe the only the principal decides who gets the candy. 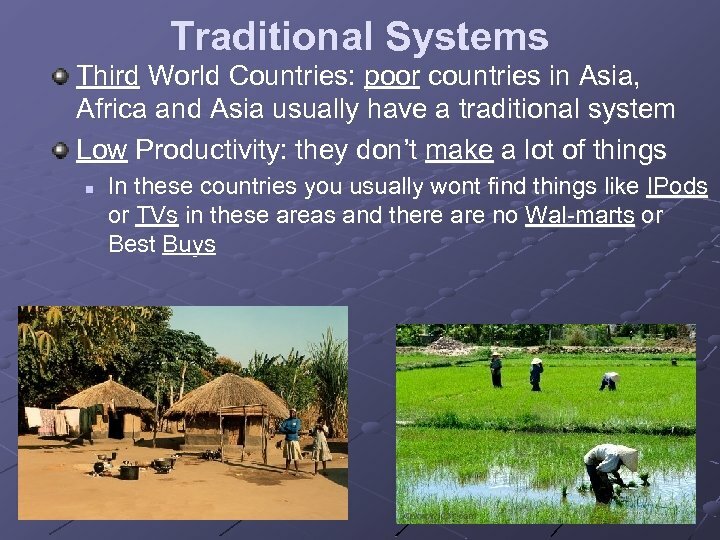 Economic Systems Each country has a limited supply of natural resources. 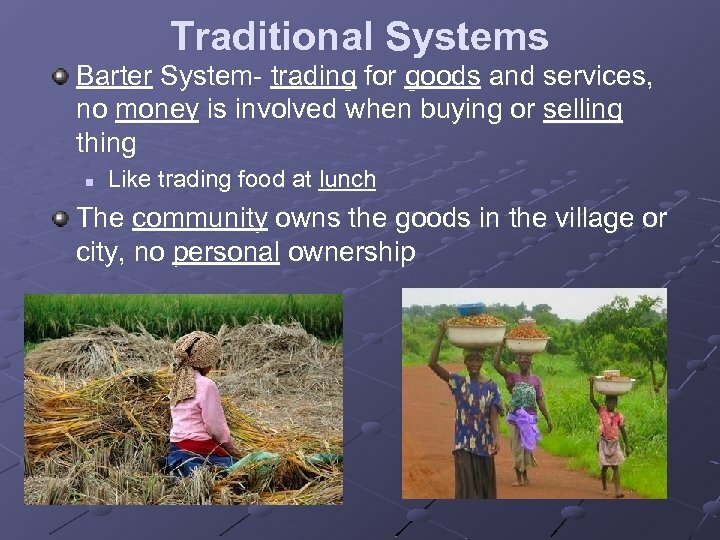 Every country needs to create an organized way to have goods made and services provided to customers. 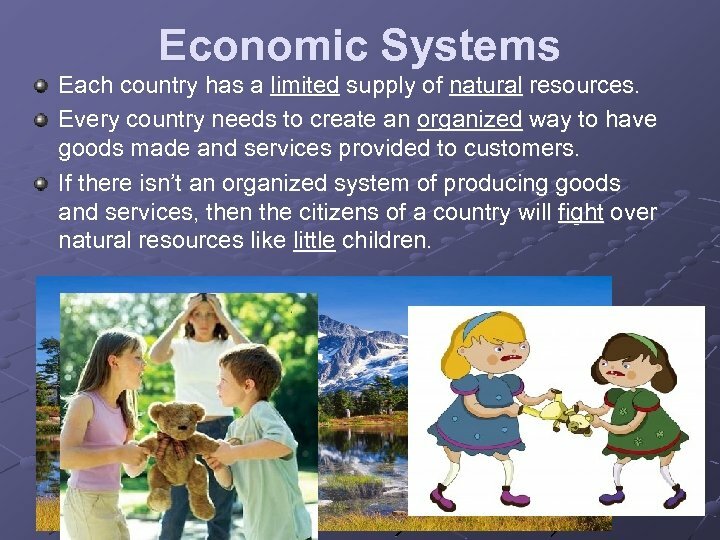 If there isn’t an organized system of producing goods and services, then the citizens of a country will fight over natural resources like little children. 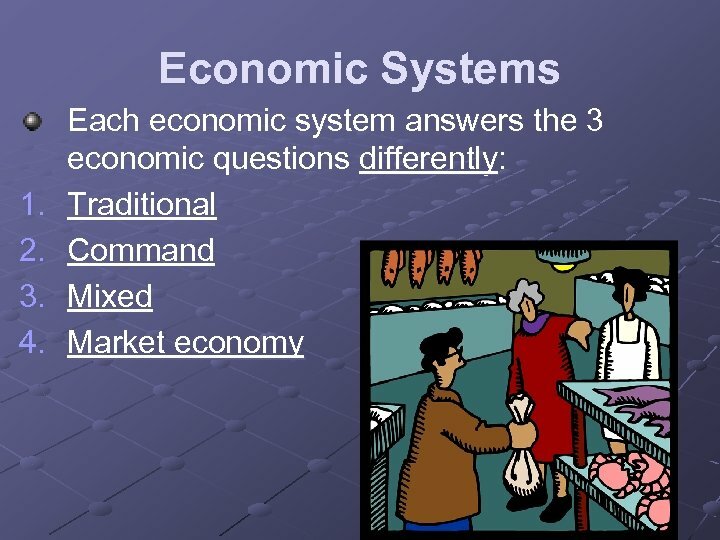 Economic Systems 1. 2. 3. 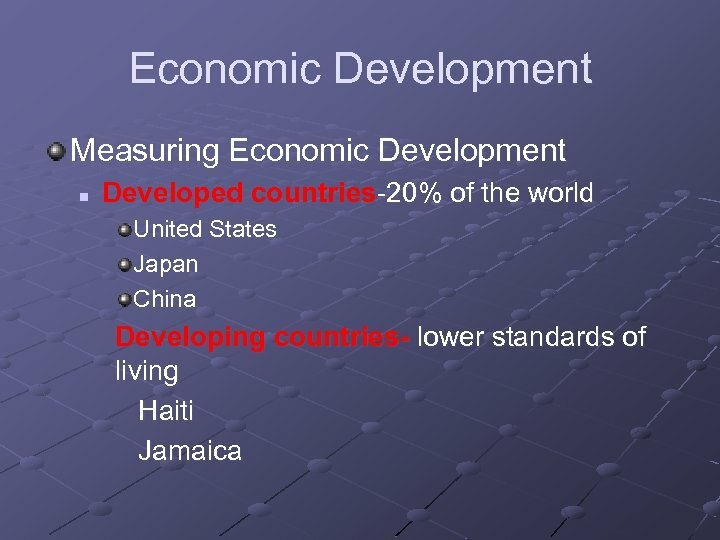 There are basic Economic question for any nation: What are we producing/servicing? For Whom are we producing/servicing? How are we producing/servicing? 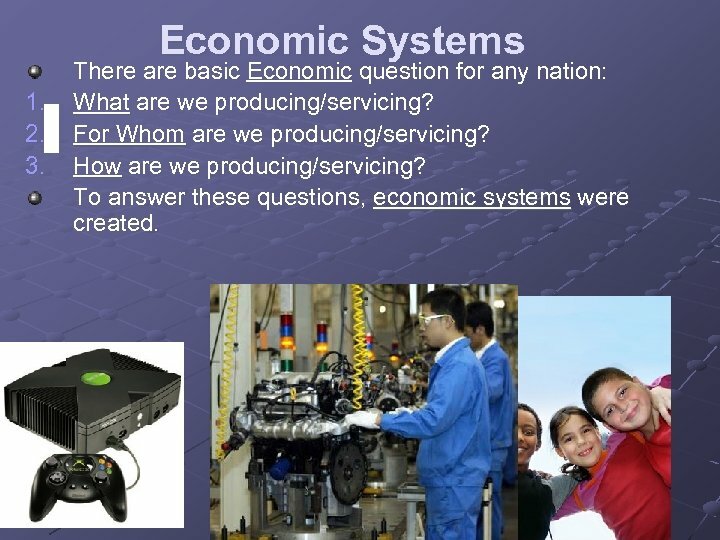 To answer these questions, economic systems were created. 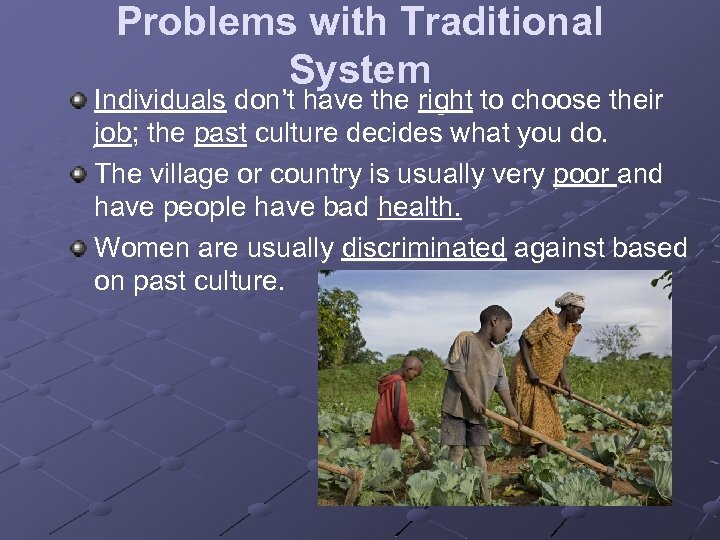 Problems with Traditional System Individuals don’t have the right to choose their job; the past culture decides what you do. The village or country is usually very poor and have people have bad health. Women are usually discriminated against based on past culture. 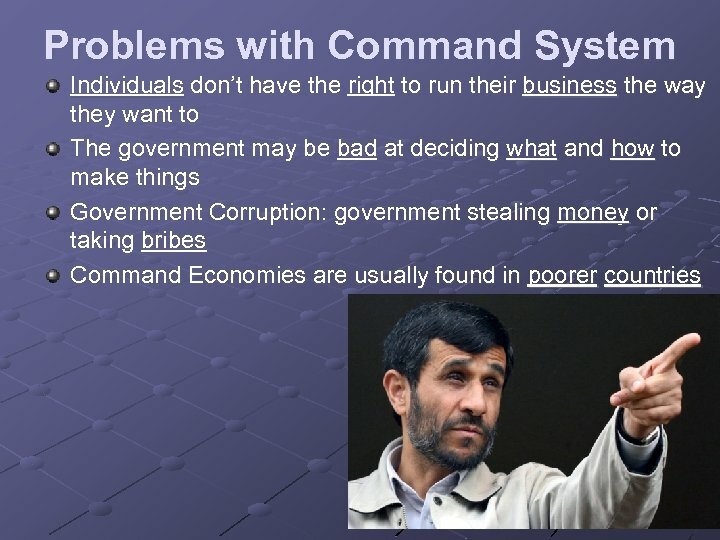 Command Systems Government determines what, for whom and how goods and services are produced Example: you may build a factory to make expensive shoes, but later the government may tell you to start making coats at a low price. 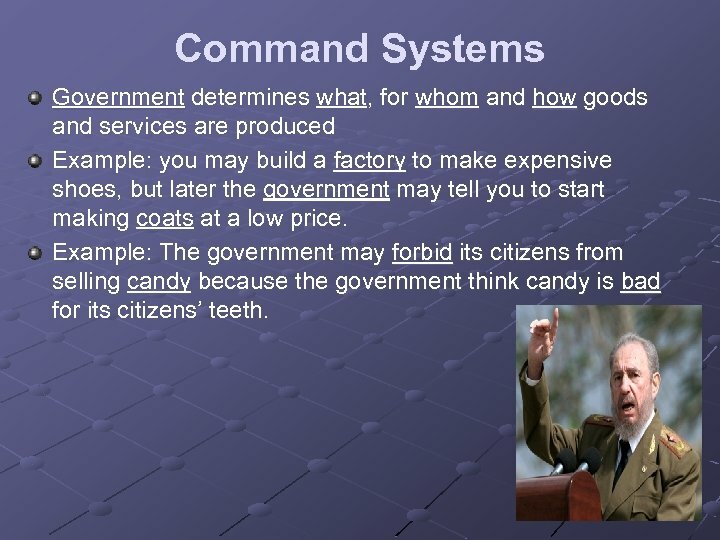 Example: The government may forbid its citizens from selling candy because the government think candy is bad for its citizens’ teeth. 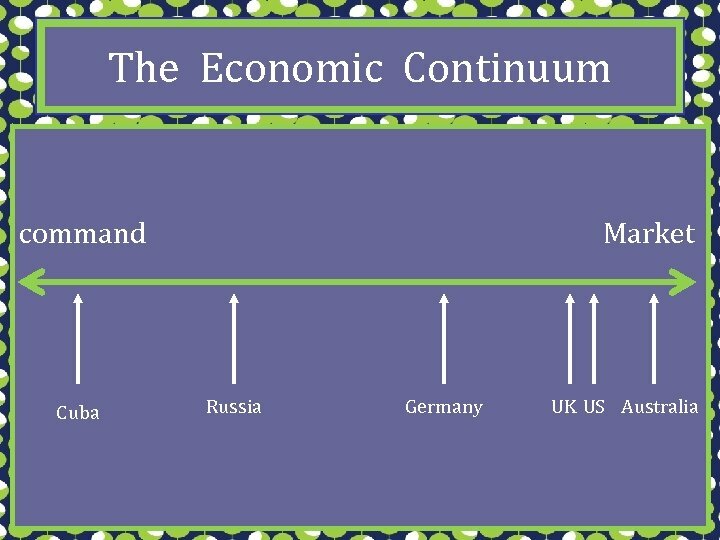 Reflection: If you had to choose between living in a country with a traditional or command economic system, which country would you choose and why? Why would you choose one over the other? 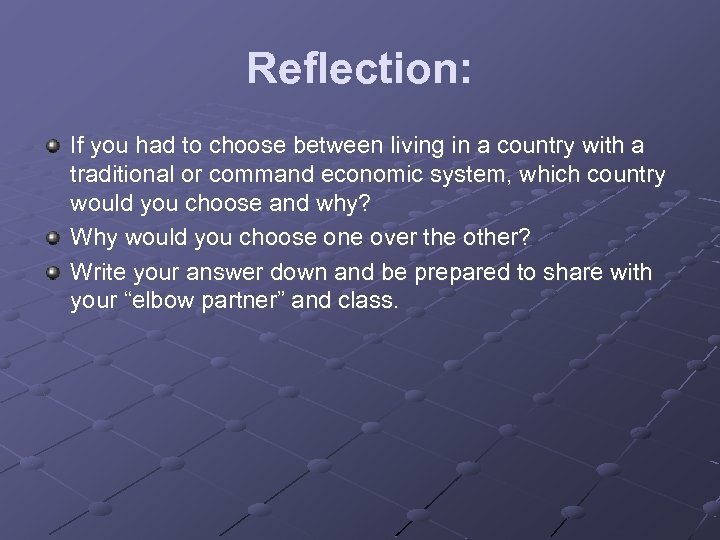 Write your answer down and be prepared to share with your “elbow partner” and class. 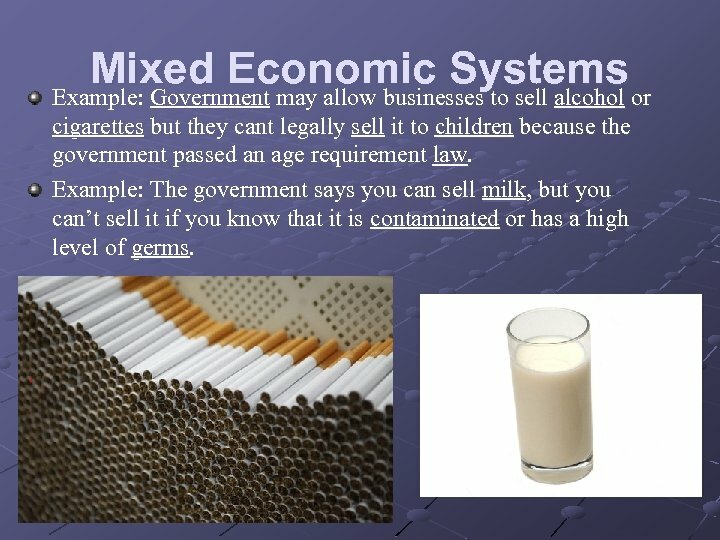 Mixed Economic Systemsor Example: Government may allow businesses to sell alcohol cigarettes but they cant legally sell it to children because the government passed an age requirement law. 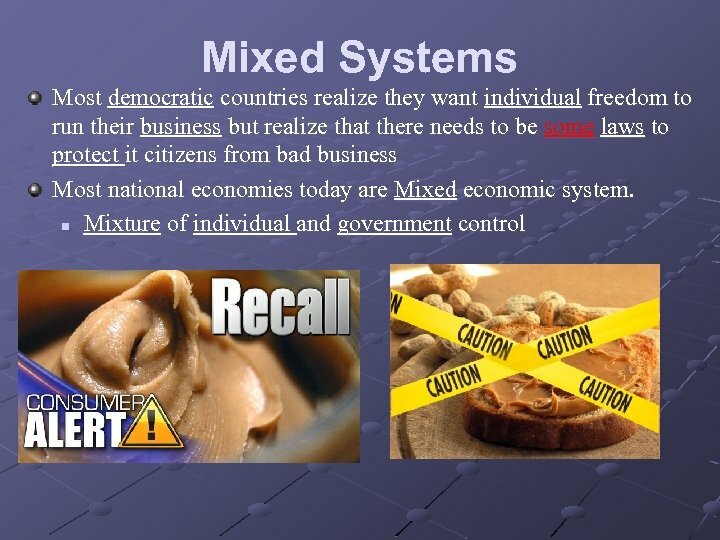 Example: The government says you can sell milk, but you can’t sell it if you know that it is contaminated or has a high level of germs. 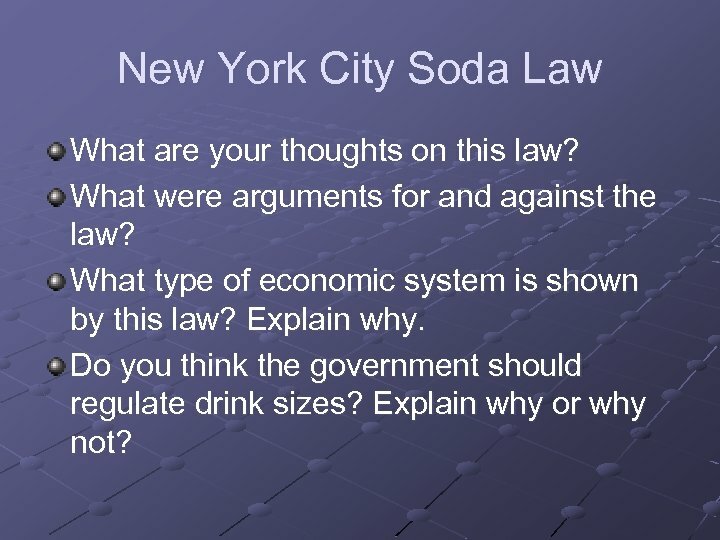 New York City Soda Law What are your thoughts on this law? What were arguments for and against the law? 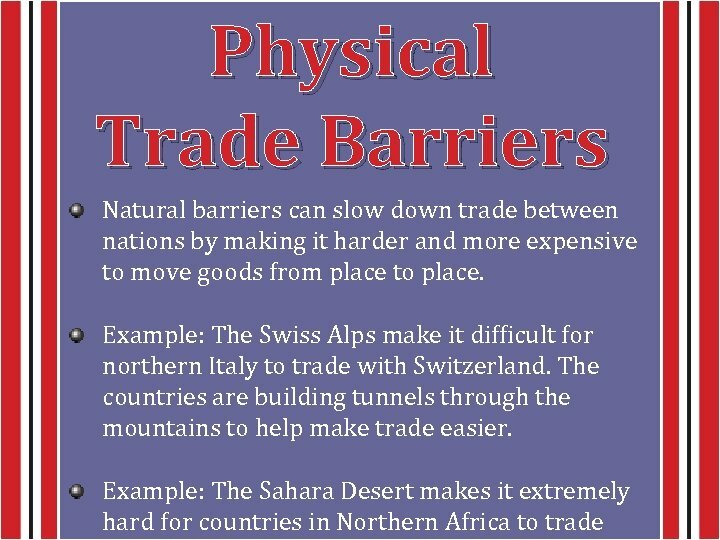 What type of economic system is shown by this law? Explain why. Do you think the government should regulate drink sizes? Explain why or why not? 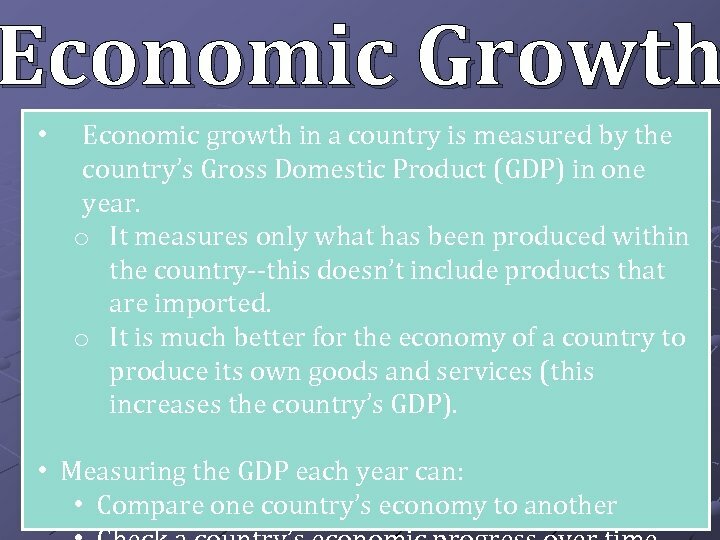 Economic Growth The more goods a country has, the more goods & services they are able to produce. If a business is to be successful, it cannot let its equipment break down or have its buildings fall apart. New technology can help a business produce more goods for a cheaper price. 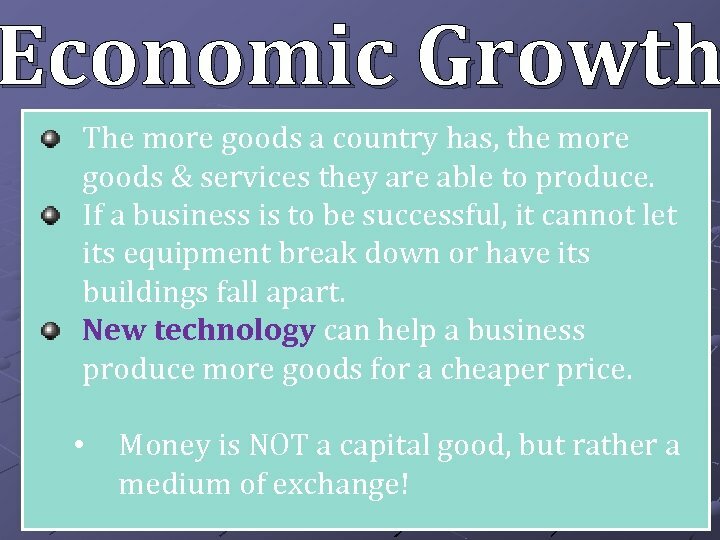 • Money is NOT a capital good, but rather a medium of exchange! 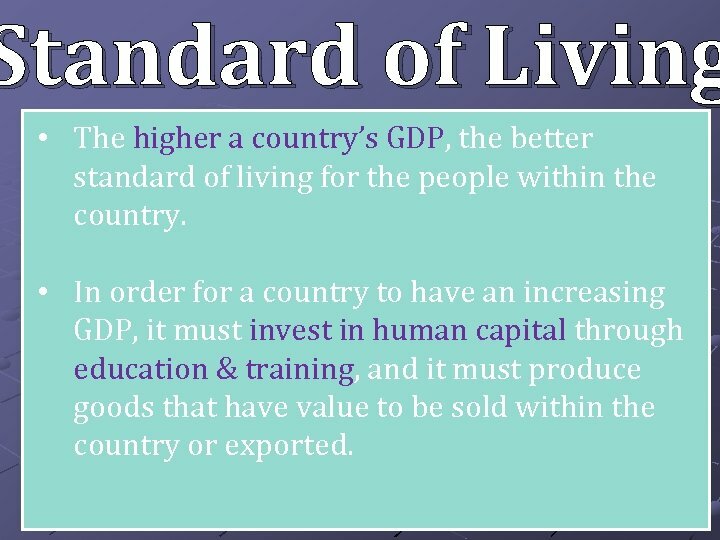 Standard of Living • The higher a country’s GDP, the better standard of living for the people within the country. 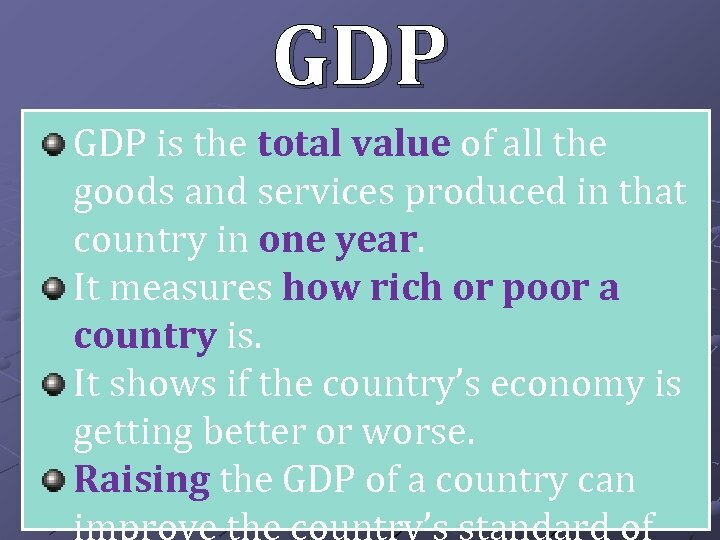 • In order for a country to have an increasing GDP, it must invest in human capital through education & training, and it must produce goods that have value to be sold within the country or exported. 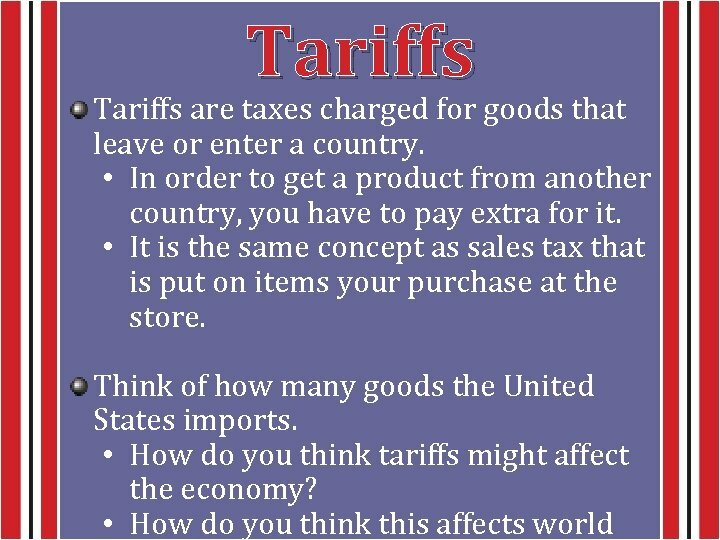 What is a Tariff? 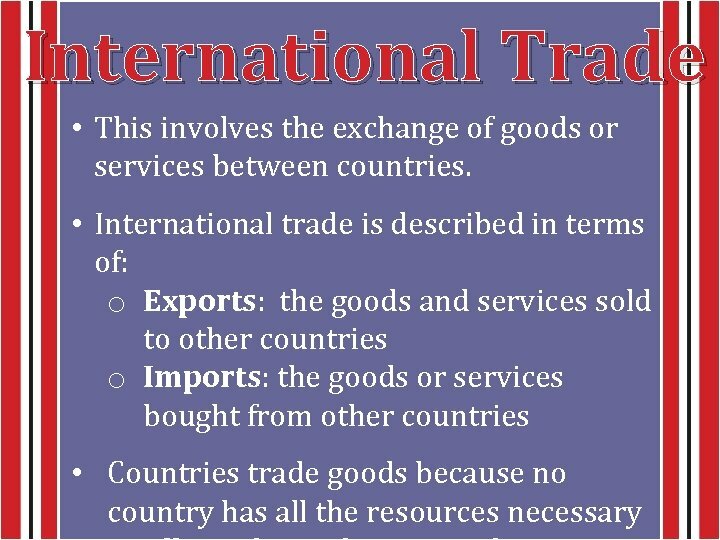 A tariff is a tax put on goods imported from other countries. 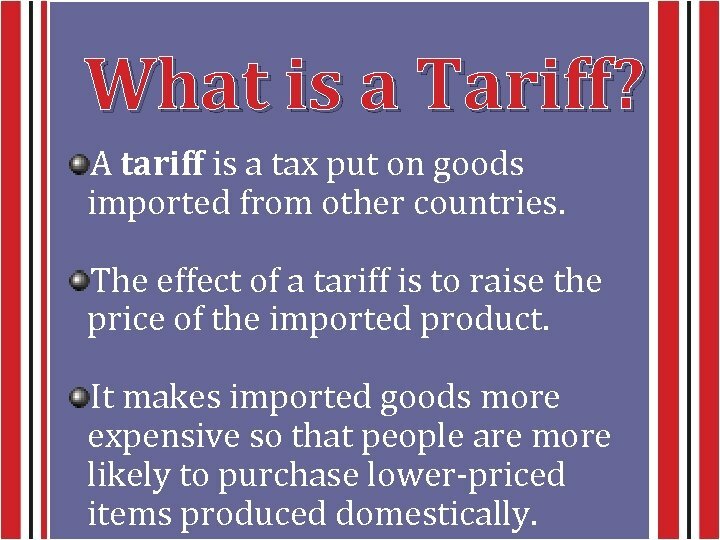 The effect of a tariff is to raise the price of the imported product. 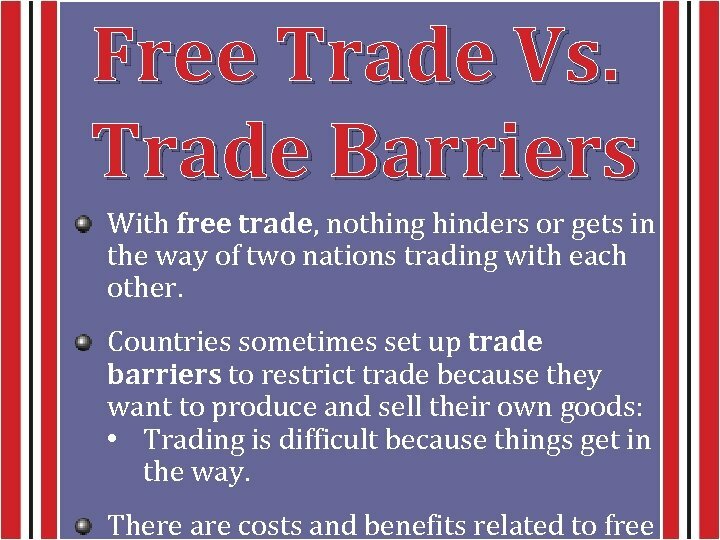 It makes imported goods more expensive so that people are more likely to purchase lower-priced items produced domestically. 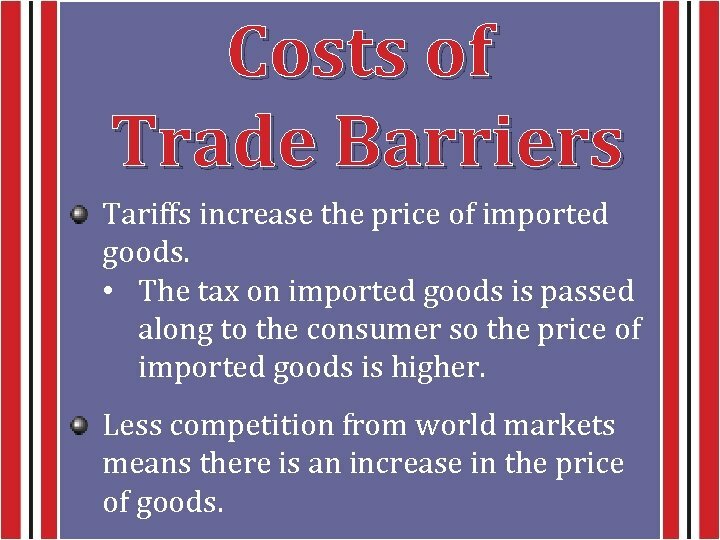 Costs of Trade Barriers Tariffs increase the price of imported goods. 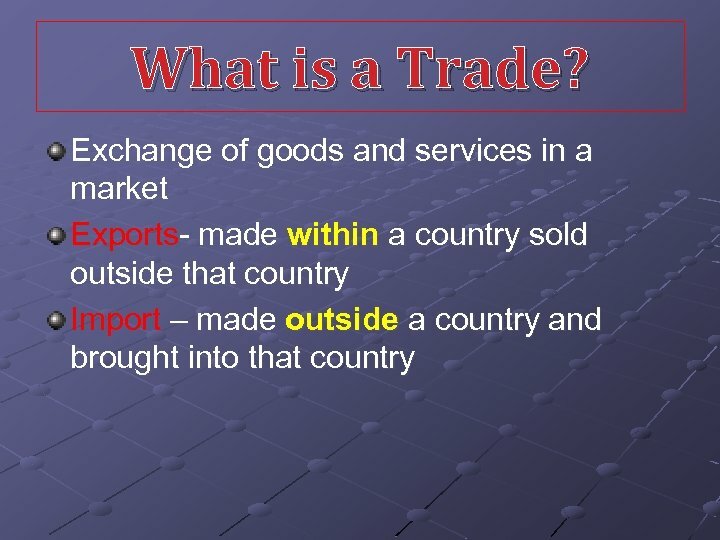 • The tax on imported goods is passed along to the consumer so the price of imported goods is higher. 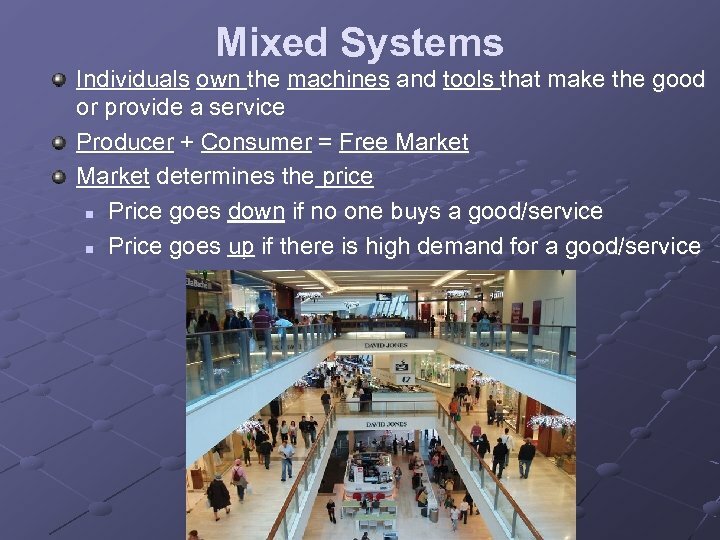 Less competition from world markets means there is an increase in the price of goods. 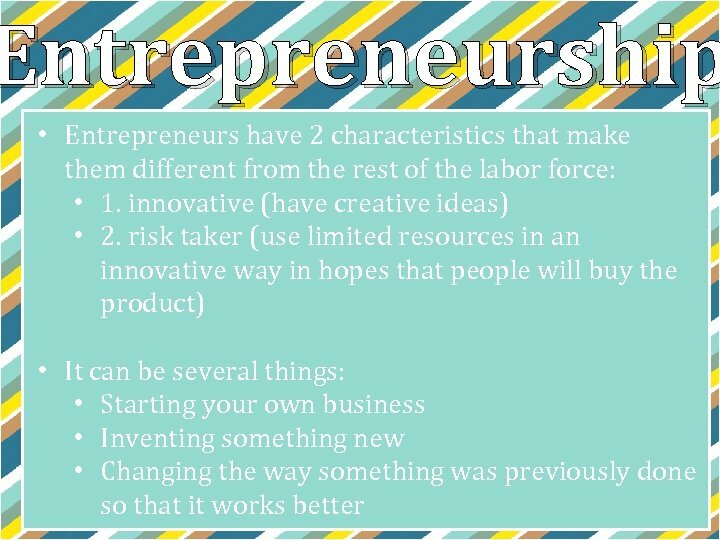 Economic Growth Entrepreneurship creates jobs and lessens unemployment. It encourages people to take risks, and in doing so, they’ve created better healthcare, education, & welfare programs. 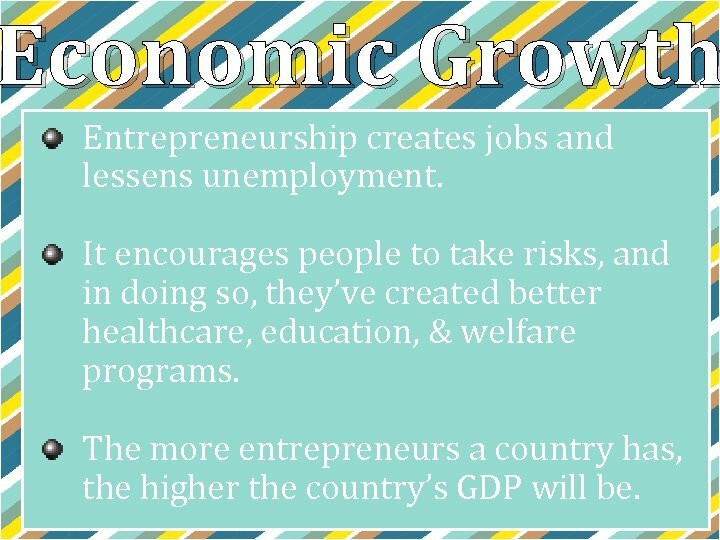 The more entrepreneurs a country has, the higher the country’s GDP will be. Entrepreneurship • People who provide the money to start and operate a business are called entrepreneurs. 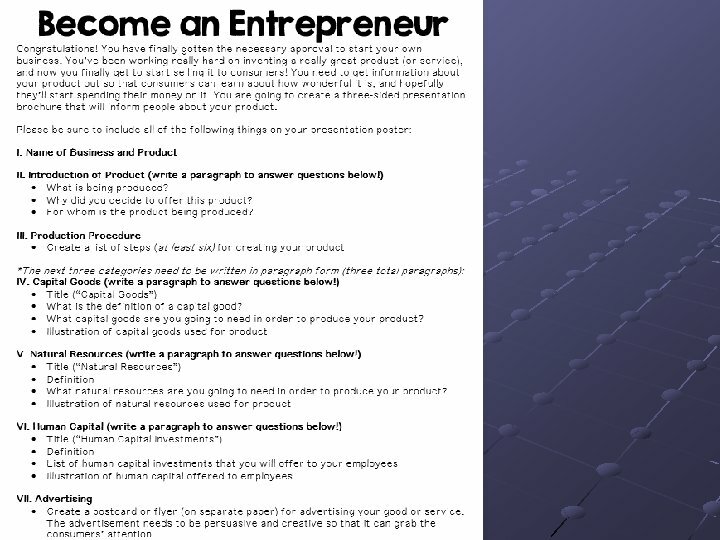 • These people risk their own money and time because they believe their business ideas will make a profit. 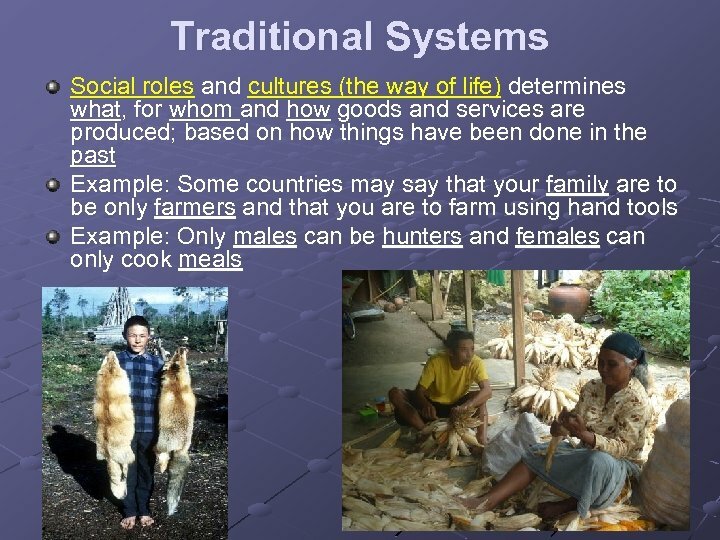 • They bring together natural, human, and capital resources to produce foods or services to be provided by their businesses.